My first legit blog post since my hiatus! I'm still on vacation mode, but I'm slowly coming back to my usual blogging schedule. I took a hiatus for the past two months to recharge because I was already feeling very demotivated and burned out from the workload and the negativity online. I also wanted to have some time to reflect and reappropriate my time on my experiences with brands. 2016 was filled with plenty of encounters with very abusive brands, so in the past months it's been all about strategizing how to get these brands off of my system. But it was also about how to further my working relationships with the brands who actually do care about me and my craft. 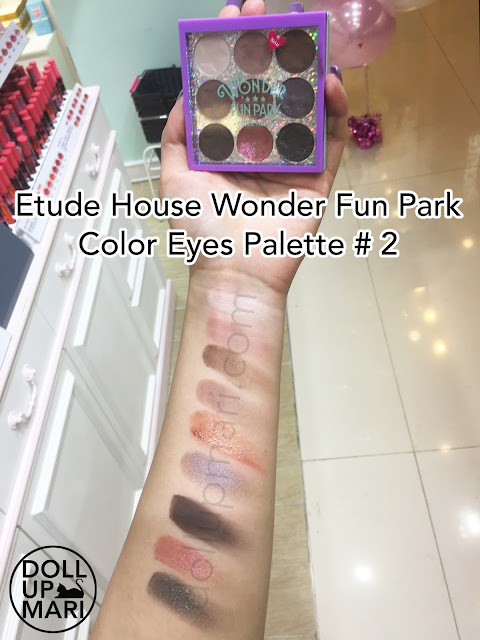 Sooo yaaay, one of the things I excitedly did when we went to HK recently was to take swatches of all swatchable items from Etude House's Wonder Fun Park collection! I know it's just arrived to Philippine stores, so this post is just in time! I reaaaally love this collection and I bought the blush, cheek brush, eye brush, and perfume. I am hoping that I finally get to snag the holo lip gloss here because it was soooooo hyped up in HK it was sold out! This collection has lip gloss, lipstick, eyeshadow palettes, eyeshadow pigments, blush, highlighter, powder brush, cheek brush, eye brush, perfume, colored mascaras, and nail sets. There's a lot going on, and not all Etude House territories choose to import everything. In HK, there was no powder brush and no eyeshadow pigment singles. I am still slooowly "reintegrating" into society after two months of barely going out (I attended two events in the span of two months compared to the usual two events per week hahaha). So I have yet to see what our territory actually imported! 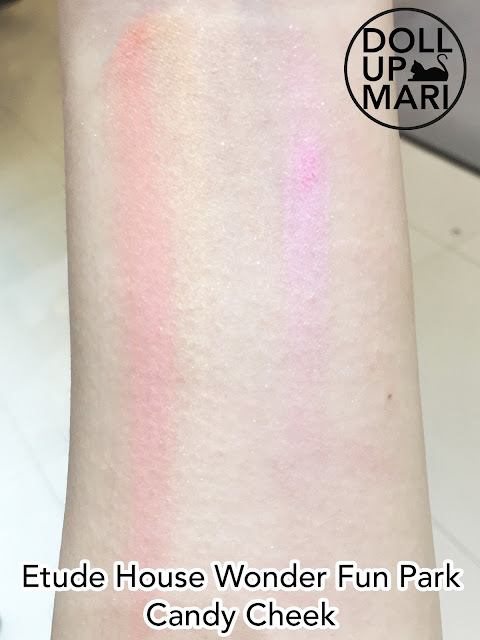 Anyways, let me share my swatches and thoughts over what I was able to swatch in HK. First off is the very popular Dear Darling Soda Tint. There is now a #BL601 on Instagram because this shade is just soooo popular. You can do all sorts of things with it. Etude House has other glittery lip offerings right now, but nothing comes close to the holo of BL601!!! These glosses are a lot like their Enamel Glosses and are comfortable to wear and do not have any annoying sensations. I personally loooooved the shade selection because there is a low level of similarity between each shade. I don't like collections where the colors are too close to each other that they're barely discernable. And in general, all the shades are so pretty. PK001- This actually counts as a watered down red to me. 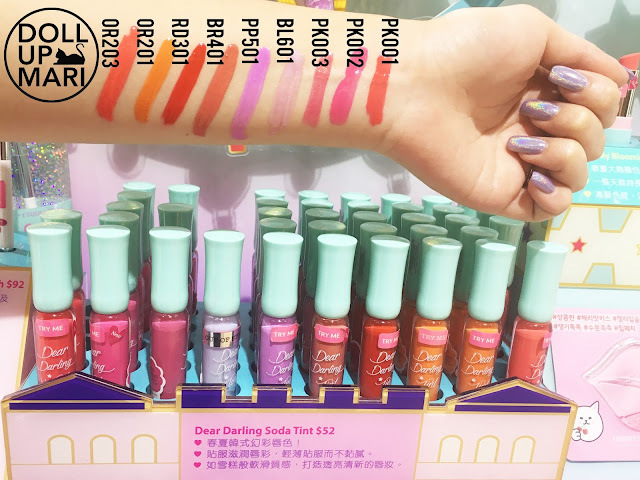 I was not super happy with the price conversion in Hong Kong so I thought that since my top 1 shade (BL601) was sold out, it wouldn't be so wise to splurge. Once I see the Philippine pricing and feel that it's more humane, PK003 and PP501 are also top picks of mine. I wanna use PK003 for everyday just to feel sassy hahaha. And PP501 because purple is such a good medium nowadays for turning the reds and browns we already own into mauves. 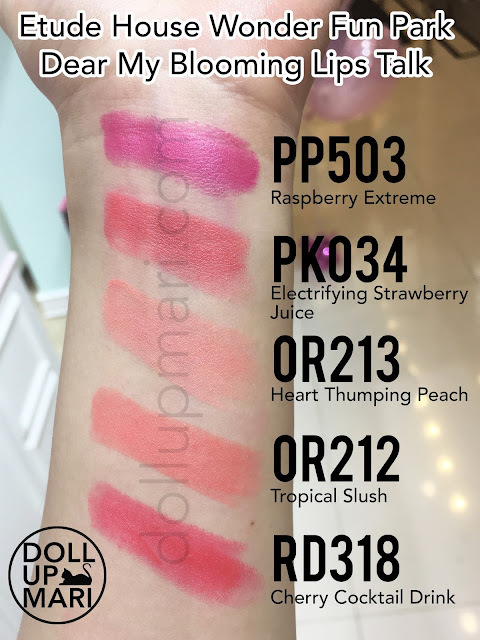 This is the lip swatch from their website. 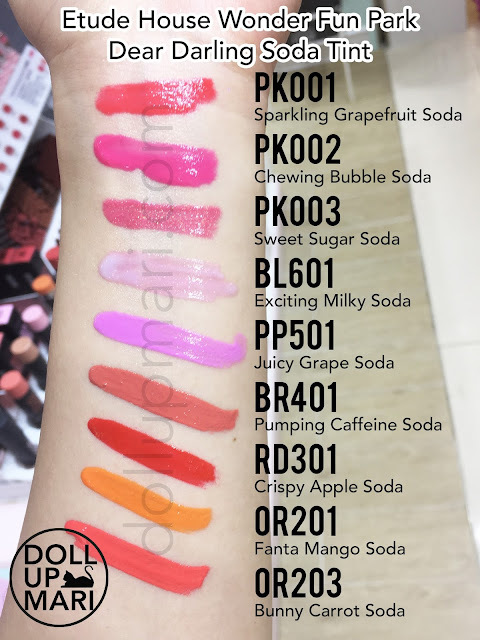 I already had to explain to each saleslady in Mandarin why I was swatching like crazy, so I think it's apparent that a lip swatch and a headshot were already out of the question hahaha. Next up are the lipsticks! 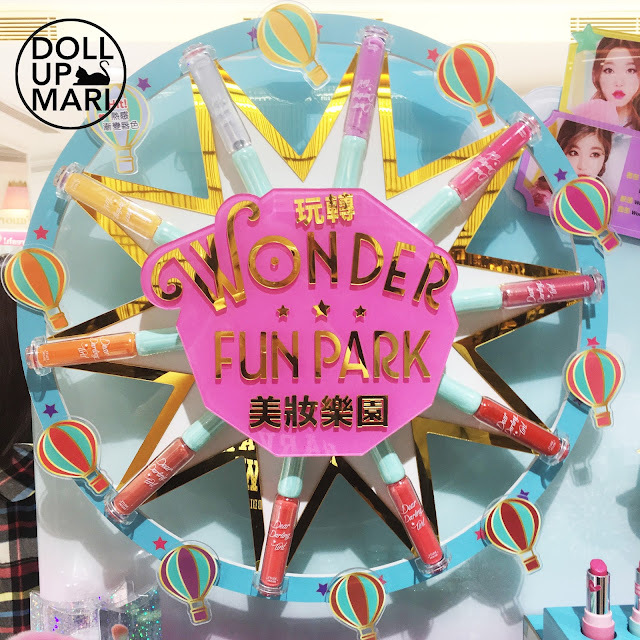 This is the special Dear My Blooming Lips Talk collection for Wonder Fun Park. There are five shades in all territories, if I'm not mistaken. There are no existing English name translations for the Korean shade names, so I made a rough translation. Please take this with a grain of salt. The lipsticks are meant to be leaning towards the creamy matte side. These "skid" while being applied; the formula doesn't move around a lot. The color payoff is more on the Korean side because these don't go on crazy intense like American lipsticks. 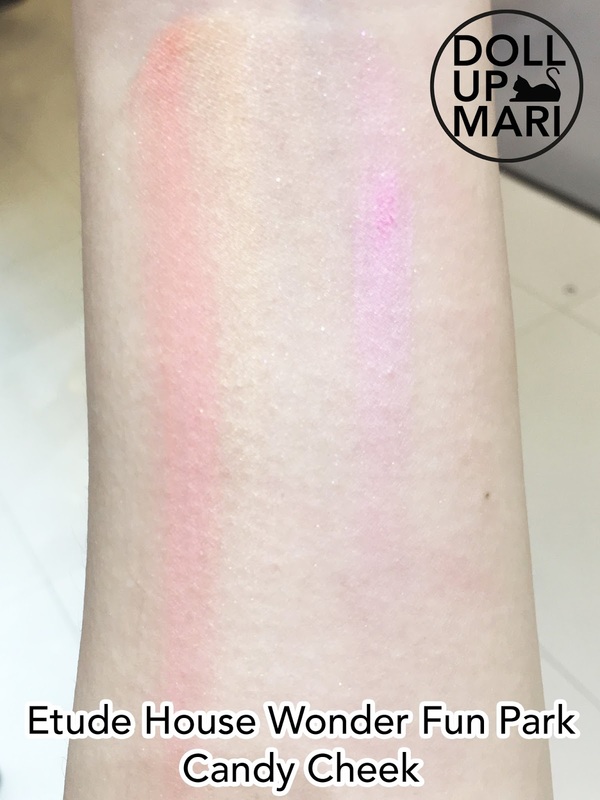 I had to swatch several times before I reached this level of pigmentation. If you're into muted shades and a formulation that is more subtle for everyday, this is a good collection to consider. There may only be 5 shades, but I honestly liked them all for myself. I can't name a single shade I don't like here. When I see a collection and say that the colors are pretty, I mean the colors are pretty, but not necessarily do I like the color for myself. So that's the difference hahaha. I honestly saw myself sporting all these shades. 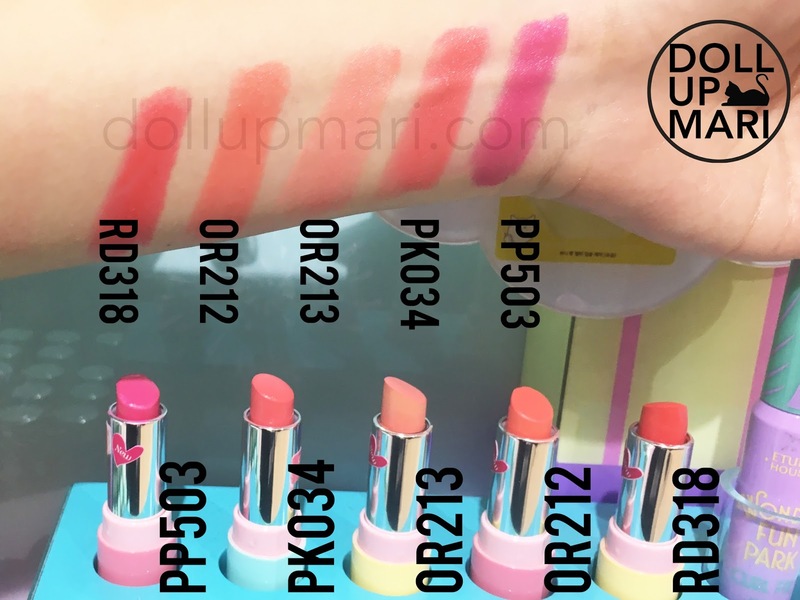 And here are the lip swatches from Etude House's website. And moving on to eyeshadow! They came up with two eyeshadow palettes. Palette 1 is a more playful kind, while Palette 2 is a more glamorous kind. In general, these eyeshadows are pretty and satiny. I just didn't buy these because while these are good, I'm looking for the even crazier pigmentation their eyeshadow singles has. I also haven't blogged about my Pink Skull palette yet, so I told myself to slow down hahaha. Palette 1 is filled with plenty of matte pastels in muted versions. I think this is good for those who want to relive the 80's without the unwanted attention. I also think that these matte shades will work as good harmonizers. 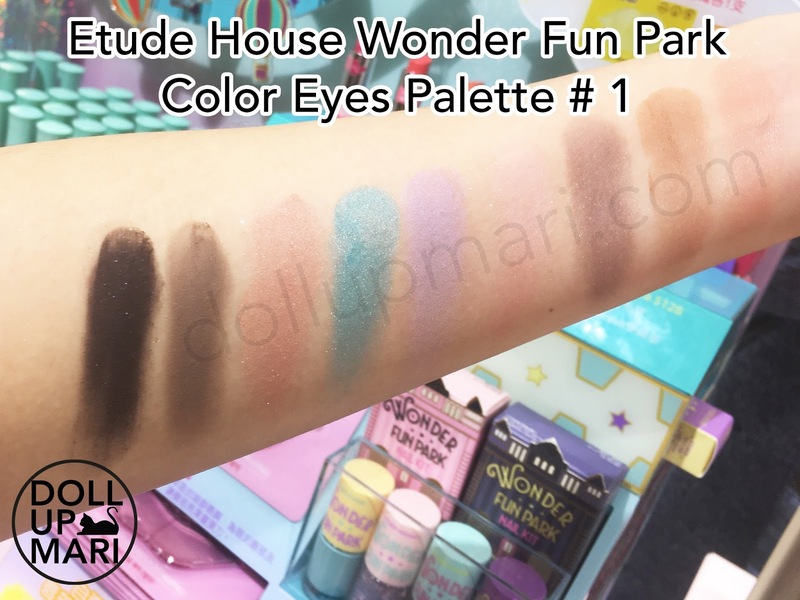 I know they're being marketed as fun 80's circus kind of eye looks, but plenty of the shades here will help to add dimension to any eye look. You can use the clay colored ones to warm up an eyeshadow look, and the purple one to make brown eyeshadows mauve or plum. The teal eyeshadow, though, I still don't know how it can be used in 2017 hahaha. Palette 2, I think, will sell better because it contains jewel versions of muted tones. There are plenty of peach and brown tones that Etude House is famous for. I only did not buy this because I feel that I have many singles that are too similar to these shades. But if that were not the case, this would be so nice to have as it contains a lot of very wearable shades. The bottom middle shade is just soooo prettyyyy, more so in real life. I finallyyyy got to see the blush in real life!!! I thought that this'll be a rainbow highlighter, but it's not. This swatch is a very exaggerated one, like I was probably on the verge of ripping the product off of the pan hahaha. This is meant to be swirled and mixed into this lovely radiant peachy pink tone. The pigments are pressed very, very well, and will not easily rub onto a brush in the same order and appear on the cheeks this way. You caaaan try to rub this reaaally hard then rub your cheek reaaally hard, but I'm not sure if you'll get the kind of look on IG. Last is the highlighter. I honestly was super sad over this! When I saw this on IG, I thought a mass makeup brand accessible in Asia had already finally picked up on the rainbow highlighter trend. But this is a very meek shade. No matter how pressure I was exerting, I just could not get it to swatch in the exact order of the pigments. And the pigments are too mild that each color does not conspicuously appear. This is meant to be mixed together, like the blush, in order to get this sort of mild holo effect. I'll be honest that I didn't buy this because it just wasn't dramatic enough for me. I think that for most people who are not blogging, this is a very good choice as this is very subtle, natural and just lends a soft ray of radiance to the wearer. This is also very fine milled so it doesn't exacerbate the appearance of pores further. But it just wasn't dramatic enough for me, as are their other highlighters. Their highlighters are good, but just not in alignment with my own vision of how a highlighter should work. So yaaay, that's it for now! I looove the fragrance because it's a sweet and sophisticated fragrance. Think of woodsy floral with a touch of cotton candy. I wish I could swatch that through this blog hahahaha. 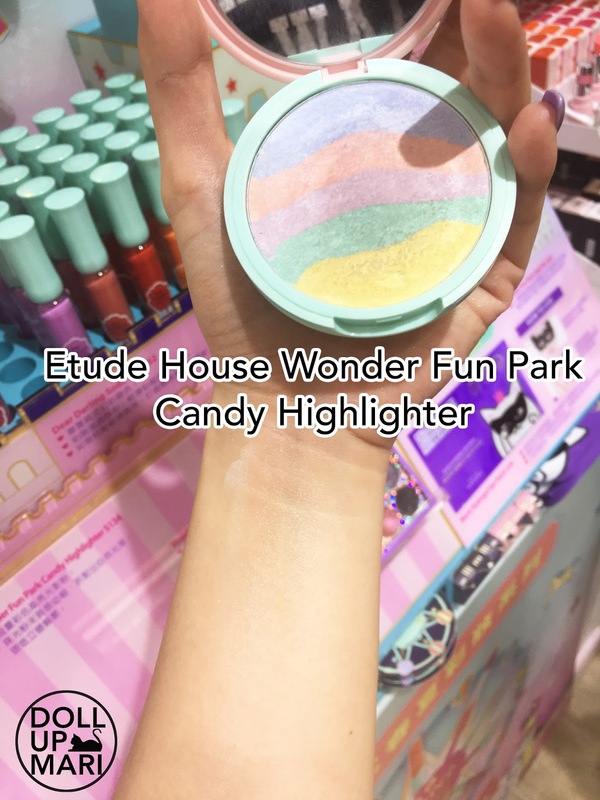 Be sure to check this out in Etude House stores near you! wow! super glossy naman tlga nila madam! lahat bagay sa labi mo po! gusto ko ganyang type of lip tint! Glitter pigments and everything nice... I am absolutely in love with the concept! 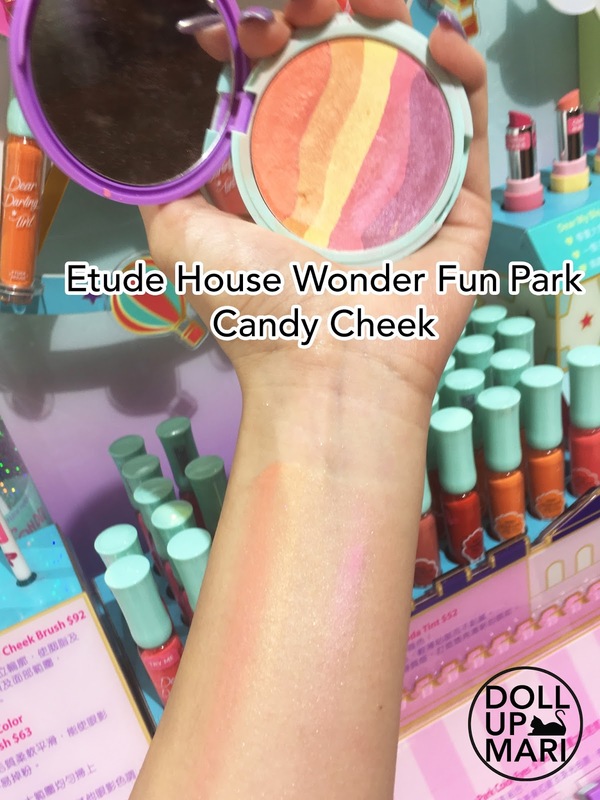 I'm also considering to get at least 1 of the lipsticks and 1 more lipgloss..
so far etude house is one of my fav brand, mostly when it comes to precious mineral bb cream. I trusted it for so many years, so im sure their lipstick will be amazing too..
been wanting to try all their lippy esp the orangey shade so refreshing! 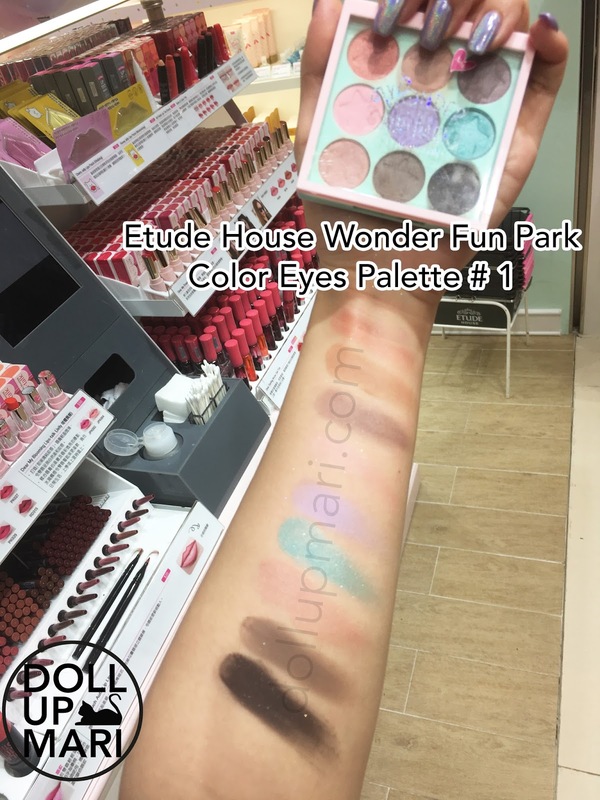 etude house is one of my fave kor cosmetics brand all of their make up is a must go use! I honestly want to say 'thank you' for sharing us some beauty tips and reviews thru your blog. Sa totoo lang, hindi ako masyadong aware sa mga reviews before but when I knew your blog, I learned a lot from different product, some do's and dont's, etc. Especially when having sensitive skin like me, I really should be aware of the products I'm using. And by visiting your blog and read some posts from you really helps me a lot. Thank you again, Miss Mari.